Earlier this week, TPG Managing Editor Eric winged his way from LAX to Shanghai aboard China Eastern Airlines business class. Here’s his review of the experience. Before flying them on Monday, the only thing I knew about China Eastern Airlines was that it is a member of SkyTeam, and that it’s based in Shanghai. I occasionally see their plain white planes with red and blue lettering at Tom Bradley International Terminal at LAX, but I’d never had the chance to fly them before now. I was booked in business class, so upon arriving at LAX, I was given a lounge pass. Mistakenly, I thought it was a pass to the SkyTeam lounge, but the Korean Airlines ladies who man the reception desk there told me that my pass was actually for the general International Lounge on the other side of the terminal where various airlines including China Eastern and Air Pacific invite their passengers to relax before the flight. The lounge was pretty standard–good free WiFi, some beer, wine, sodas and water, a few snacks including mini sandwiches, chips, cookies and nuts, a small cafe-style area and a television section of the lounge, and then a lot of free outlets so I could make sure my electronics were fully charged before the flight. Like many flights from LA to mainland China, mine departed in the early afternoon and would arrive in Shanghai in the early evening the following day. My plan was to work for the first part of the flight, have a meal, watch a movie and take a long nap, then try to stay awake for the rest of the flight so I would be tired enough to sleep when I got into Shanghai that night. 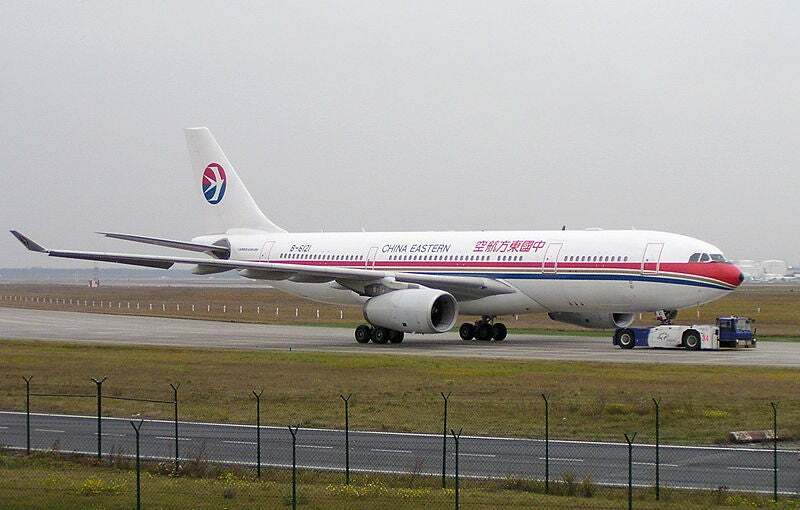 When I found out that I was booked into business class aboard the airline’s A340, I went to China Eastern’s website to see what service onboard might look like. 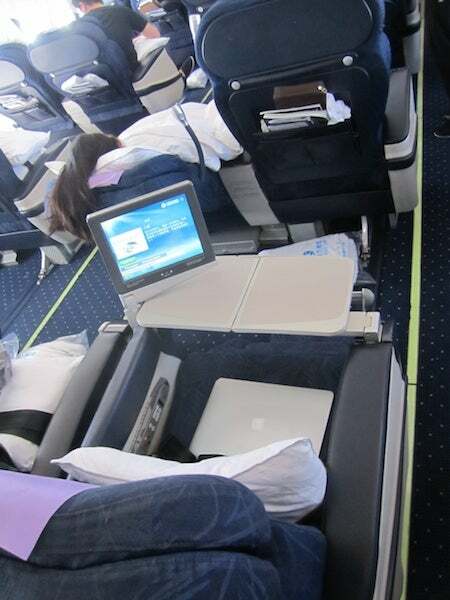 I found the following picture of a business class seat, which seemed like a standard angled lie-flat. 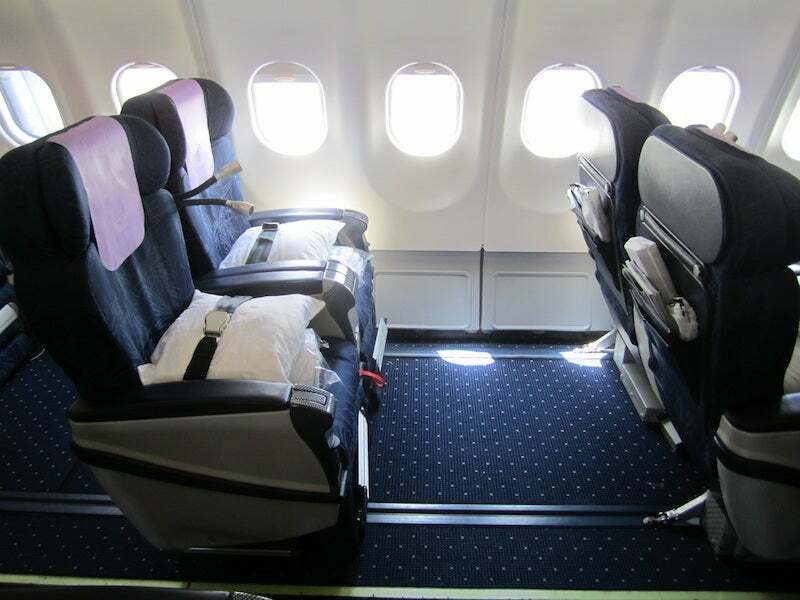 It turns out that this is actually the business class seat aboard the airline’s A330-200, which flies on the Shanghai-London route. That plane has just 24 of these seats with 59 inches of pitch and 169 degrees of recline. As I said, though, I was aboard the A340. I couldn’t find any information on the seats specific to that aircraft, though SeatGuru told me the seats were angled lie-flats as well. SeatGuru also said there were 40 of them, though even the diagram of the plane on SeatGuru showed there were 42–I’ve found that the site has gotten a bit lax on providing accurate, up-to-date information both about configurations and routes on which you might fly certain aircraft, so I’ll be looking around at other similar sites from now on–arranged in seven rows in a 2 x 2 x 2 configuration. What I found aboard the plane were actually recliner-style business class seats. Granted, they very spacious and did angle quite a lot, but they weren’t bed-style angled lie-flats, so they weren’t ideal for sleeping. 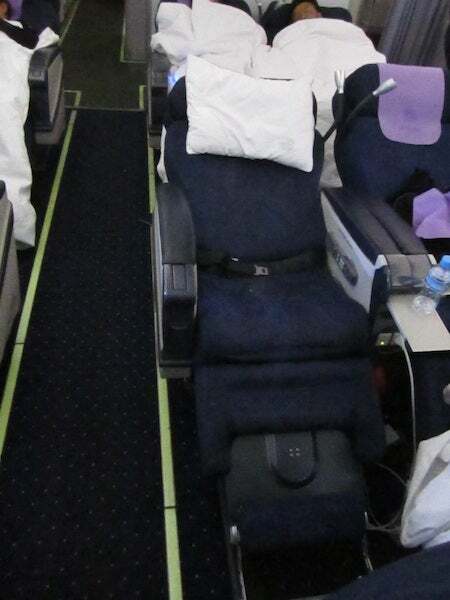 I did manage to get a few hours’ sleep very comfortably on them, but it still didn’t compare even to the angled lie flats they have on other airlines like Lufthansa and Air France. 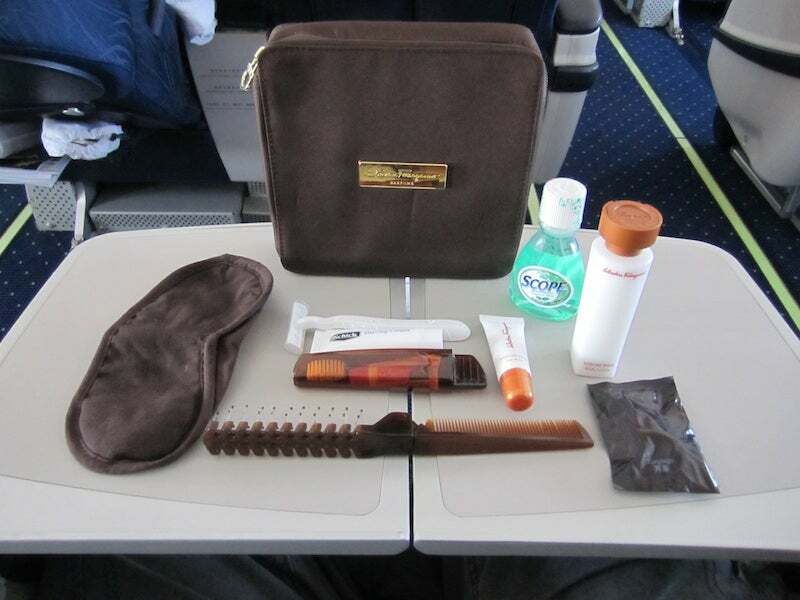 Though this isn’t one of the airline’s newer planes, the cabin was clean, and there were plenty of flight attendants handing out juice and water, taking meal orders and helping passengers get situated. 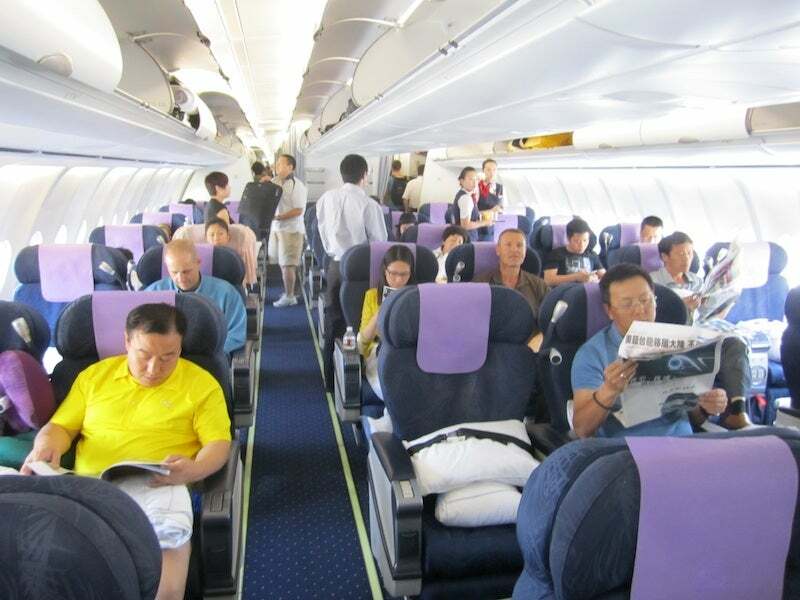 The seats had handrest-stowed personal television screens with a selection of about two dozen Chinese, American and European movies both recent and a little outdated. There weren’t any television shows loaded on them, though, and the music selection was scant as well. The screen was controlled by a handheld remote, which was a bit unwieldy and hard to control fast-forwarding or rewinding. Flight attendants handed out noise-canceling headsets about a half-hour into the flight for passengers to use. My seat also came with a large duvet and medium-size pillow, a personal AC power port where I could plug in my laptop and work through much of the flight, a pair of blue China Eastern slippers, and a Salvatore Ferragamo amenity kit with Tuscan Soul lip balm and hand lotion, toothbrush and paste, mouthwash, brush-comb combo, a shaving kit, eye mask and ear plugs. 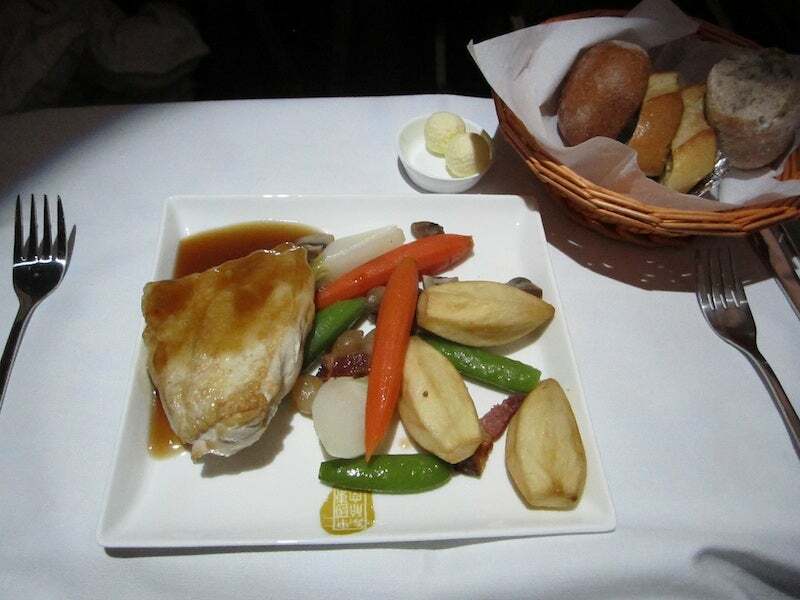 Because of the timing and length of the flight, there were two full meal services–one at the beginning and one at the end, as well as a late-night snack served to passengers who asked for it right around the middle of the flight. During the first meal service–lunch–they unfortunately ran out of the Chinese menu with choices like three-color egg and double-boiled chicken soup for starters, and mandarin chicken or vegetables with bok choy and rice. Instead, I had the Western-style menu with a scallop salad with sundried tomato in sesame dressing, truffle-infused cauliflower soup, smoked pork belly with braised apple cider sauce and sour cream crushed potato, a cheese plate, and fresh fruit for dessert. The same thing happened at the meal service 2 hours before landing (which was like a full dinner), so I had the small arugula salad with walnuts and cranberry, and chicken breast with applewood smoked bacon and potatoes. The meal in the middle of the flight was basically a huge Chinese version of Cup O’ Noodles with shrimp and bok choy and a small fruit plate. I was pleasantly surprised by the wine choices they had onboard including Taittinger and a selection of Australian and French wines such as Wolf Blass Yellow Label Cabernet, DeBortoli Family Selection Cabernet-Shiraz and Tyrrell’s Old Winery Chardonnay. The flight attendants all spoke English perfectly, and they were all neatly dressed and made up, which made a good impression. There were a few shortcomings, like the fact that they never gave me a napkin during my meals and they even forgot silverware, but all in all, they were quick, friendly and several of them acted as informal babysitters to kids flying business class with their parents so that during the long middle stretch of the flights the parents could get some rest while the kids who were wide awake didn’t keep other passengers up. My one-way ticket cost about $3,000, though it was purchased for me on behalf of a consulting project I’m doing in China. 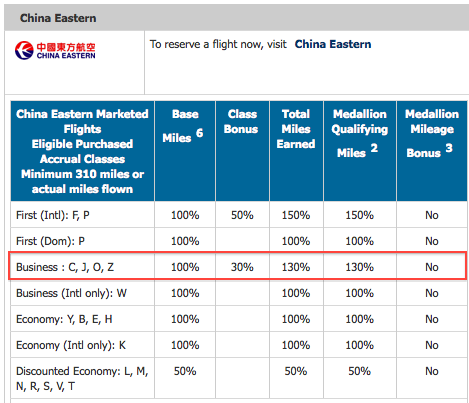 Because China Eastern is a SkyTeam member, I could have used Delta miles to book my flight, though it would cost me 120,000 miles since Delta charges the same amount of miles for a roundtrip as for a one-way award. Another option would be to book a one-way through Air France Flying Blue, but they levy taxes/fees of about $600 on partner flights to Asia. 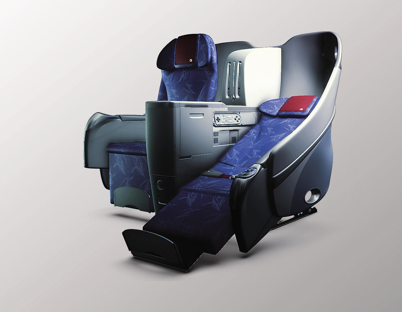 Expertflyer shows China Eastern award availability, though finding business class seats is very difficult. However, coach is readily available, with over 9 seats available on many days. Since my ticket was paid for, I earned miles on this flight and credited them to my Delta SkyMiles account. The base miles were 6,485. As usual, there is a class-of-service bonus. Unlike many of Delta’s other partner airlines such as Alaska, Aeromexico, Air France KLM and Virgin Australia, which would have given me a 50% bonus for flying business class for a total of about 9,700 miles, Delta will only give me a 30% bonus for flying China Eastern business class for a total of 8,400 miles instead. I’m not sure why the partnership is limited in that way, but because of it, I missed out on about 1,300 miles. So if you have Asia travel coming up and are looking to make the most of your Medallion status bonus and class-of-service, you might consider other partners such as Korean Air, where you will get full value for both. All in all, the flight was pleasant and smooth, and though 14 hours in an old-school recliner-style seat wasn’t a world-class experience, it sure beat coach!